This thesis discusses the relation between syntactic movement and comprehension deficits in Broca’s aphasia. Syntactic movement is one of the central factors underlying the comprehension deficit of these patients. The main claim defended in this thesis is that the way in which this deficit is usually related to syntactic movement is too coarse. 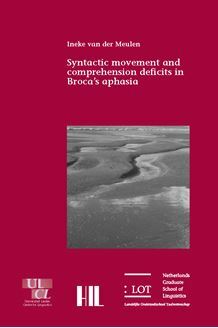 It shows that a more refined view on syntactic movement contributes to a better understanding of language comprehension in Broca’s aphasia. Although patients’ comprehen­sion of many constructions derived by movement has been extensively examined, wh-questions have received relatively little attention. Studies on English-speaking Broca patients suggest that patients’ comprehension of wh­questions differs from that of other constructions involving movement. This thesis provides new data on the comprehension of wh-questions, by examining the comprehension of these questions by French-speaking Broca patients. These data show that the comprehension deficit of Broca patients is related to the type of movement through which constructions are derived. In particular, it is shown that Broca patients have more difficulties comprehending structures derived through XP-movement than those derived through feature movement or head movement. This new characterization of the comprehension deficit in Broca’s aphasia also leads to a new syntactic analysis of clefts and relative clauses. The thesis thus shows that there is a mutual relation between neurolinguistics and theoretical linguistics. Theoretical linguistics provides well-defined tools useful for describing the data of Broca patients. These data, in turn, lead to new research questions and analyses for the field of theoretical linguistics. This thesis shows that a multidisciplinary study such as the present one is fruitful for the research in both fields.